I've been working with Odesk for almost two years, and got started with Guru dot com just last week. And somehow the dream of making a decent living from the comfort of my home has been struck down again and again by Paypal, one of the most popular forms of payment on the internet. Somehow this has been the bane of my life since January 2009, wondering if the payments will drop into my bank account at HDFC which is a damn good Indian bank, comparable to banks across the world. Not only has been really annoying, frustrating and so on and so forth causing me to wonder whether I made a good choice by moving away from Instructional Design to freelance writing, I'm still confused as to whether Paypal will finally resolve its issues that it currently has with Indian banks at the moment. 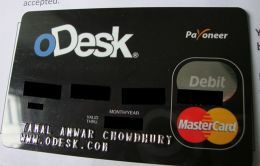 However, Odesk, being as cool as it is... sent out a group mailer for independent contractors in India to take another payment option called Payoneer, by waiving off the $ 10 fee. STEP 1: You have to apply for a Payoneer card, through whichever freelance service you use. and you'll get the card about 15 to 20 days later, not unless you live under a rock! STEP 2: You have to go to your account (which you should have created earlier) at the Payoneer website, and enter the card number (that you have received) as well as a four digit PIN of your choice. Keep that PIN safe! STEP 4: Once the funds appear in your Payoneer account (almost immediately! ), proceed to load it on to your card. Now there are two options here, the first of which being loading the money onto your card (which will cost you about $ 2.50) within two hours or the second option which will load the money onto your card in two business days with no transaction fee. The next set of steps include withdrawing money from an ATM in India. Background: For some reason, I trust ICICI as a bank even though I don't have an account, and continue to loathe the nationalized banks (such as SBI, SBH, PNB and so on and so forth). Personally, I feel they're in the dark ages. Anyways, this is what I did, to receive funds accordingly. I first made sure that the money was indeed loaded on to the card, by checking the balance (in dollars) at my Payoneer account. STEP ONE: I found the nearest ICICI ATM which had an facility where the machine ONLY required you to swipe and remove the card immediately. Don't use ATMs that take in your card, as it might not give it back to you if there are some issues with transactions. STEP THREE: Enter the PIN (you selected) and the amount of money that you'd like to withdraw. STEP FOUR: You'll receive the money promptly. Enjoy! NOTE 1: A transaction fee of $ 2.15 (roughly about Rs. 120) is charged for every transaction, so ensure that the withdrawals you make is a sizeable one, perhaps keeping the number of transactions a month to about 2-3... which is how much a bank would charge you in service fees anyways etc. NOTE 2: Also note that a one-time charge ONLY of roughly $9 to $13 (about Rs. 650) will be withdrawn from your account for the first transaction. to say that I've really enjoyed surfing around your blog posts. After all I will be subscribing to your feed and I hope you write again very soon! I've been exploring for a little for any high quality articles or blog posts in this sort of area . Exploring in Yahoo I ultimately stumbled upon this website. Studying this info So i'm happy to exhibit that I've an incredibly good uncanny feeling I found out just what I needed. I so much indisputably will make certain to don?t overlook this site and give it a glance on a constant basis. yourself? Please reply back as I'm planning to create my own personal blog and would love to know where you got this from or just what the theme is called. Thanks! through anything like this before. So wonderful to discover somebody with some genuine thoughts on this issue. written article. I'll make sure to bookmark it and return to read more of your useful information. Thanks for the post. I will certainly comeback. First off I want to say excellent blog! I had a quick question which I'd like to ask if you do not mind. I was interested to find out how you center yourself and clear your mind before writing. I have had difficulty clearing my mind in getting my thoughts out there. I do enjoy writing however it just seems like the first 10 to 15 minutes are lost simply just trying to figure out how to begin. Any suggestions or hints? Thank you! Excellent post. I was checking constantly this blog and I'm impressed! Very helpful info particularly the last part :) I care for such info much. I was looking for this particular info for a very long time. Thank you and good luck. it, you can be a great author.I will be sure to bookmark your blog and definitely will come back sometime soon. Hello to all, it's actually a nice for me to pay a visit this site, it contains useful Information.